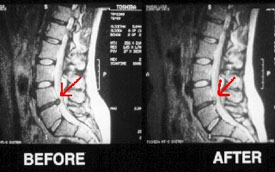 Axial Spinal Decompression (also known as VAX-D, IID, and DRS) is an advanced form of non-invasive, non-surgical disc repair to relieve back pain and other problems associated with spinal disc injuries such as: (herniations/tears), facet arthrosis and calcification (spinal arthritis, lipping and spurring); and radicular neuropathy symptoms (numbness, tingling and burning). Spinal Decompression has been used in the treatment of thousands of patients who before were looking only at surgical intervention as their only form of pain relief. Now under conservative decompression therapy, people suffering with pain and radiculopathies associated with these conditions can now be treated without surgery. This means little or no loss of time or wage from work, no nasty surgical scarring or post rehabilitative therapy and quicker recovery back to activities of daily life. Mechanical decompression works by slowly and gently stretching the spine, taking pressure off compressed discs and vertebrae. 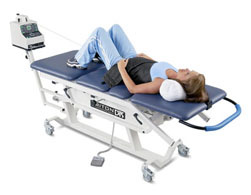 Patients are treated fully clothed and are fitted with a pelvic harness that fits around their pelvis as well as a thoracic harness as they lie face down, or face up on a computer controlled table. The doctor operates the table from a computerized console, where a customized treatment protocol is entered into the computer. Each treatment takes about 30 to 45 minutes. The average treatment protocol is approximately 30 treatments within a six to seven week period of time, depending on the individual’s case. There are many different ailments that can attribute to your spine asserting pressure on it’s discs. Poor posture, bad body mechanics, repetitive stress and acute injury can cause your vertebrae to compress your discs or cause them to slip out of alignment. When your discs are out of alignment they apply pressure on your nerves causing pain and discomfort. Anyone with acute or chronic back pain, bulging discs, herniated discs, degenerative disc disease, pinched nerves, facet syndrome, sciatica, radiating arm or leg pain can benefit from decompression treatment. The most common spinal condition treated with decompression therapy is a herniated disc. Spinal compression can cause disc herniations to expand, putting pressure on surrounding spinal nerve roots. Decompression treatment takes the pressure off these damaged discs so that the disc herniation will shrink back closer to its original size. Degenerative disc disease is also a common condition treated withdecompression therapy. 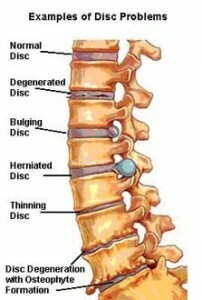 Loss of disc height can be exacerbated by spinal compression, causing the vertebral bodies to move closer together. This can cause nerve compression and other forms of common back pain. Decompression eliminates the overwhelming pressure on degenerated discs reducing or eliminating painful symptoms. Facet joint syndrome is yet another condition treated with spinal decompression. Of all the conditions, this one shows the least promising results for permanent pain relief. Conceptually, facet syndrome causes pain due to arthritic changes in the vertebral bones.Decompression helps to create more space between the vertebrae, hopefully reducing painful symptoms. Medical research has shown non-surgical decompression therapy demonstrates good to excellent statistical results for long term pain relief with little or no loss of time work, no nasty surgical scarring or post rehabilitative therapy and quicker recovery back to activities of daily life. Call Graceland Chiropractic today to see if you’re a candidate for our Spinal Decompression therapy, (614) 436-2225.